We stacked an extra chamber on top and engineered it so that cold stuff can go in, but hot stuff can't go back up. 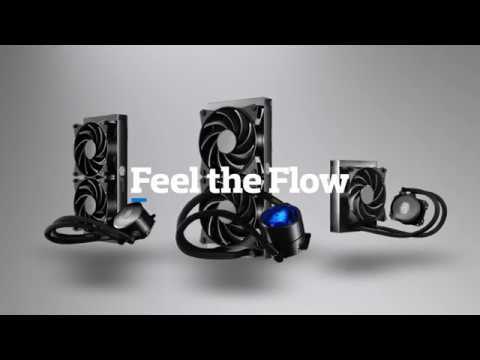 We grabbed technology from top-end DIY liquid cooling kits to create a powerful pump that sprays liquid directly at the centre of the water block. It solves the issue of slow flow and allows us to mount more ultra-fine fins on the copper base, creating more surface area from which the coolant can take away heat. Water-based cooling solutions are for those who want to push their system. The harder you drive your CPU, the better AIO liquid cooling performs. Features • Preserving Parts: Liquid heated by the CPU is isolated from sensitive components using two chambers in the pump. • Maximizing Absorption: The water block, customized and packed densely with micro-fine plates, absorbs more heat from the CPU than traditional designs. • Zoning in On Heat: Liquid is funnelled directly at the hottest part of the CPU and carried away quickly through technology normally used in high-end DIY models. • Recycling the Cool: Heated liquid is more efficiently cooled through a completely unique radiator fin design. • Getting It Out: Heat in the radiator fins is expelled far out of the case by new MasterFan Pro 140 Air Pressure fans. • Keeping It Quiet: Silent drivers in the pump and MasterFan Pros reduce decibel levels to nearly a whisper. • Installation Made Simple: With parts of the assembly tool-free.